Businesses face-off against rising costs to help under-resourced youth hockey players get in the game. 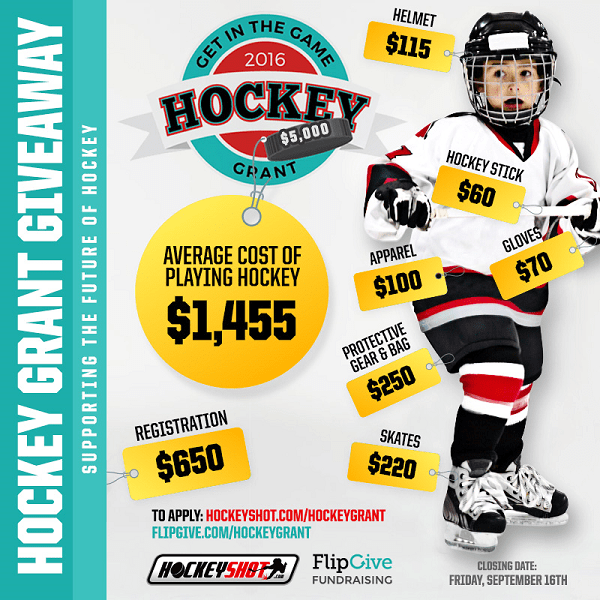 TORONTO, Ontario (August 15, 2016) – FlipGive Fundraising, a free digital fundraising platform, and HockeyShot.com, the largest online specialty retailer of hockey training & skill-building products worldwide, have partnered up to launch the GET IN THE GAME Hockey Grant, a new initiative designed to provide under-resourced youth with financial support to play hockey. The GET IN THE GAME Hockey Grant will extend $5,000 in funding and will be awarded as two TEAM Grants of $1000 each and six INDIVIDUAL Grants of $500 each. The grants will cover hockey equipment and hockey league registration fees. Pricey equipment and the cost of registration are leaving many kids behind. While overall participation in Hockey is gradually growing in Canada & the US, participation among children from lower income families is declining dramatically. Budget struggles, pricey equipment and the cost of registration are leaving behind a cohort of children who have the ability to play but not the cash to participate. According to a recent report, the two major barriers to participation in sport are enrollment fees (61%) and equipment costs (52%). Nine in 10 of those surveyed believe sports participation is becoming too expensive and a vast majority (82%) say they know a child who cannot participate in organized sport due to the hefty price tag. Of concern is that less players from lower income homes are participating in hockey and more specifically, the next generation of hockey potential is not being developed. FlipGive.com has been helping struggling players and teams for over 2 years with a fast and easy way to fundraise online. “This new Hockey Grant is an extension of our business’ commitment to supporting youth athletes,” says CEO, Mark Bachman of FlipGive. “With hockey ranked as one of the most expensive sports to play, this grant will help provide much needed support for a group of under-resourced children”. Sport has the ability to transform and develop youth beyond the game itself. “Hockey shaped who I am” says J-P Brun President & Co-Founder at HockeyShot.com “The team experience fostered the importance of building trust, responsibility and sportsmanship – important lessons I’ve carried into my career.” He added “It’s important to me that we broaden the exposure of this great sport, and these life lessons to those who might not otherwise have a chance to play”. Applicants must reside in North American and be between the ages of 4-18years. Grant winners will be announced by September 30, 2016. FlipGive combines the convenience of online shopping with the best of online fundraising, making it easier for people to raise money, and for retailers to generate sales while improving communities. Fundraisers earn up to 50 per cent for their school, sports team or cause by shopping with retail partners. To start your fundraising campaign visit flipgive.com.